When you are not well versed in an art form it’s a joy to feel suddenly that you get it. 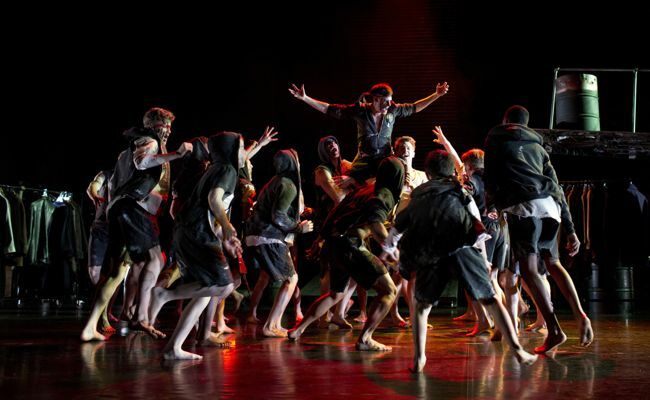 Matthew Bourne’s production of “Lord of the Flies”, choreographed by co-director Scott Ambler, is so vital, clear and full of zest that newcomers will be as delighted as dance aficionados. Part of the pleasure is knowing that along with the professionals on stage are many youngsters new to the form who have leapt at the chance to take part in a major production. Now in the middle of a 13-city UK tour that will take it to Cardiff, Newcastle, Norwich and Bradford between now and December, and is expected to venture next year to New York City, Washington DC and Los Angeles, the show was at London’s Sadler’s Wells Theatre for a sold-out run last week. William Golding’s 1954 novel about a group of schoolboys who degenerate into savagery when marooned on a desert island is related entirely in dance that ranges from group celebrations, mass fights, chases, and duels to poignant solos. The setting is switched to the basement of a deserted theatre where all the exits are locked securely. The only sets in Lez Brotherston’s design are platforms of various heights, large costume hampers, ladders, oil drums and racks of clothes on hangers, all of which are employed in the action. Terry Davies’s music goes from choral optimism to industrial chaos with cues that underscore the increasing sense of dread and occasional deep melancholy. Paul Groothius’s sound design serves to enhance the shut-in fear and adds to the menace while Chris Davey’s lighting courses from stark black and white to threatening reds. Professionals, of course, dominate the dancing and they are all blazingly gifted but 24 novices are on stage almost all the time and they throw themselves into the action with confidence, enthusiasm and abandon. Bourne and James Mackenzie-Blackman, for producers New Adventures and Re:Bourne, say in the Sadler’s Wells programme that the non-professionals were chosen from more than 6,000 who participated in workshops and taster sessions conducted across the nation. So far, more than 150 have appeared in the production. Venue: Sadler’s Wells, London Oct. 8, 2014. Directors: Matthew Bourne and Scott Ambler; Choreographer: Scott Ambler; Based on the William Golding novel; Music: Terry Davies; Designer: Lez Brotherston; Lighting: Chris Davey; Sound: Paul Groothuis; Cast: Sam Archer, Ross Carpenter, Philip King, Luke Murphy, Sam Plant, Danny Reubens, Layton Williams, Dan Wright. Running time: 110 minutes including 20 minute interval. This entry was posted in Music, Reviews, Theatre and tagged 'Lord of the Flies', New Adventures, Re:Bourne, Sadler's Wells, Terry Davies, William Golding. Bookmark the permalink.